PHOTO: Trump And Aides Sit On Mar-A-Lago Wedding Reception Chairs To Watch Syrian Strike Video - Joe.My.God. President Donald Trump was complimenting the wife of Chinese President Xi Jinping over steak dinner on Thursday as his military prepared to fire dozens of cruise missiles into Syria. Shortly after laughing with Xi in the ornate, candle-lit dining room of his Mar-a-Lago resort, Trump made a televised address in front of a hastily assembled backdrop to say he had ordered a surprise strike on a Syrian airfield. Trump arrived at Mar-a-Lago at about 3:15 p.m. New York time. 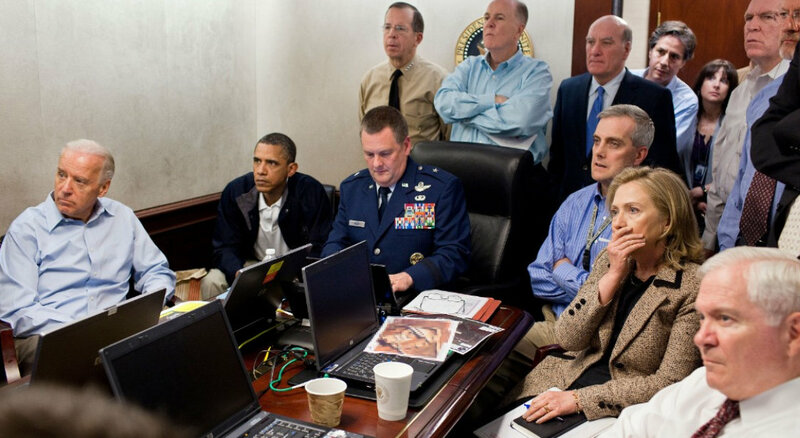 Shortly thereafter, three groups of military and national security officials were gathered and linked via video conference to discuss military options against Syria. 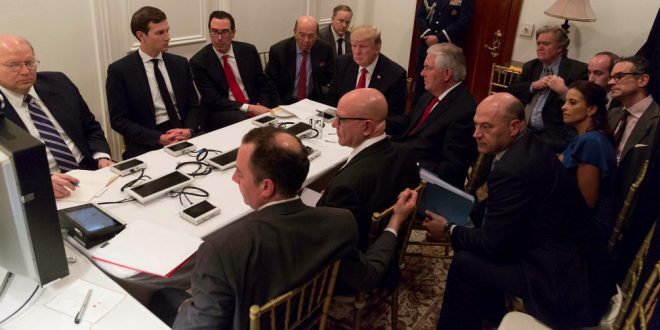 Trump and more than a dozen of his aides crowded into a small, plain room at Mar-a-Lago, where they sat on wedding reception chairs for a video conference on the Syria strike.